Simple interface, Convert images with two clicks. it's that simple. Easily convert various RAW images to common formats. Numerous vector and raster formats are supported, including .ico, & .icns formats. Convert image formats in batches, effortlessly! Get any amount of images converted in one click! The fastest and simplest way to convert between various image formats. 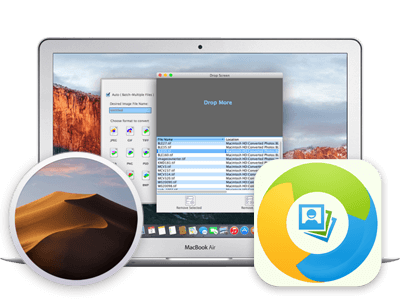 It allows you to convert a variety of source image formats to most popular image formats, such as PDF, GIF, PNG, JPEG, JPG 2000, TIFF, BMP, TGA and PSD. 321Soft Image Converter can convert not only common image formats like JPG, PNG, GIF, TIFF, BMP, PDF, ICNS, ICO, TGA, PICT. but also perform RAW image conversion - converting RAW files ( .CR2, .ARW, .SR2, .NEF, .PEF, .ORF, .DNG, .RAW ) produced by digital cameras into JPG, PNG, TIFF, PDF, or other image formats. Perfectly convert images to a specified format from different source formats. Just 2 simple clicks to batch convert multiple image files. drag and drop picture(s) to the window. Then click on the destination image format. No complicated settings. Convert RAW photo .NEF, .CR2, .ARW, .SR2, .PEF, .ORF, .DNG, and etc. TIFF, GIF, PNG, JPEG, JPEG-2000, PDF, ICNS, TGA, PSD, and BMP are supported. It is optimized for Mac OS X 10.10 Yosemite and Mac OS X 10.11 El Capitan. Step 1: Drag the images into the window. Step 2: Check the "Auto (batch multiple files)". Step 3: Select your output format. then output images are automatically saved in the same folder as the original images. I was searching for something to convert a lot of Canon .CR2 files that another photographer took for me - and also some tiff files. I needed to convert hundreds of images on my macbook pro. I found this app and gave it a shot after trying many converters online that didn't work. This worked great at converting all my CR2 images -- no issues, simple interface. Works perfectly. Thanks for making this app! 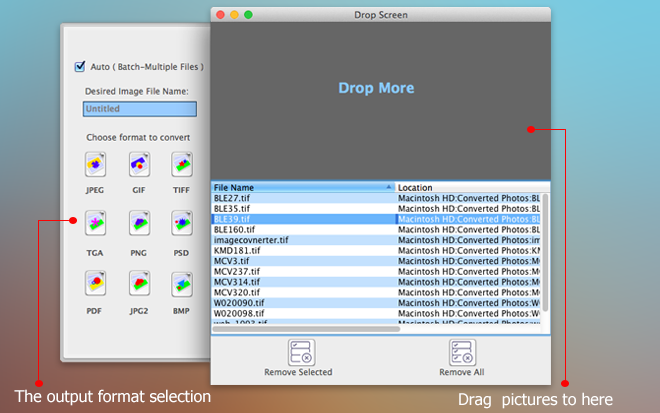 It makes it so easy to convert large tiff into small JPEG on my Macbook. Need to convert a lot of images? Download free Image Converter today to see how it can help you!